This is another one of those sneaky dishes that I was able to make fish for dinner and Ryan didn’t seem to be completely shaking in his boots. Salmon is pretty mild and takes on savory flavors like soy sauce and chili paste really well. Those tastes are complimented by rich and meaty shitake mushrooms and the sweetness of baby bok choy. This dish is made my sauteing the bok choy and mushrooms in a mini-broth- which is almost like braising it- until most of the liquid has condensed or evaporated. The vegetables are removed and kept warm while the salmon is seared in the broth’s remaining juices. A one dish dinner that is best accompanied by steamed white rice with sesame seeds. Whisk together the rice wine vinegar, soy sauce, chili paste, brown sugar, and chicken stock in a small liquid measuring cup. Set aside. In a large sauce pan, heat the sesame oil on medium heat. Add the shallots, garlic, and boy choy, and lightly saute until they both start to caramelize. Add the liquids mixture and simmer on low for 8 minutes or so, rotating the boy choy every few minutes. The liquid will start to evaporate and the boy choy will soften. Remove the boy choy from the pan and keep warm on a plate tented with foil. Increase the heat of the pan to medium-high. Lightly season both sides of the salmon with salt and pepper. Add the butter, mushrooms, and salmon to the pan. Saute for 4-5 minutes per side, or until the salmon is cooked to medium temperature. 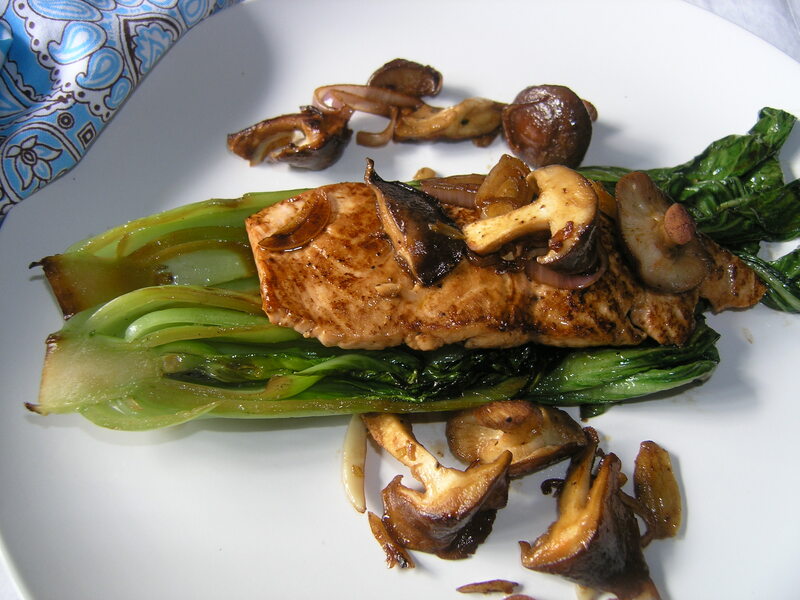 Serve the salmon and mushrooms over three bok choy halves and any remaining pan juices. This is the best salmon I’ve ever made!